NOTE: The full scholarly and peer-reviewed version of this story, with complete citations to archival records, letters, diary entries, and images of the first two pages of the sonata is forthcoming in Musical Quarterly. In 2009, as a graduate student in musicology at Duke University, Christian first heard a scratchy 1972 recording by the French pianist Eric Heidsieck of a Sonate de Pâques . . . by Felix Mendelssohn. She knew, however, that Fanny Mendelssohn (not yet Fanny Hensel, since she wasn’t married until October 1829), had written about an Easter Sonata in April 1829. She resolved to get to the bottom of the story and started carefully combing through all available letters, diaries, and archival records to see if she could establish a documentary trail. She was able to find enough documentary evidence to strongly suggest that the Easter Sonata was by Fanny, not Felix, but until a manuscript could be found and identified, it was only a strong scholarly hunch. She visited the Staatstbibliothek zu Berlin to view a bound manuscript collection that had reportedly once contained the Easter Sonata and saw that the pages numbered 89-110 were indeed missing, but no one could tell her anything about where the mysterious manuscript might be. She was at a bit of a brick wall at this point, until she started talking to then newly hired professor of music composition at Duke University, John Supko. He had done his Fulbright Study at the Schola Cantorum in Paris, and Christian knew that Eric Heidsieck had taught at that same institution. She asked him if the name sounded familiar; he thought it did, and a few days later emailed Christian with the contact information for Heidsieck. A few days after sending a letter of inquiry to Heidsieck, Christian received a response: Heidsieck would be delighted to talk and share more about his work with the Easter Sonata! Christian arranged to travel to Paris to meet with Heidsieck in person, only expecting to be able to hear about his performance and to learn more about the sonata. A few days before the trip, though, she asked Heidsieck on the phone if it would be possible to see the manuscript. A few hours later, Heidsieck returned her call: he had been able to get in touch with the owner, whom he knew personally, and had arranged a short visit for both of them with M. Coudert. Thus, on a beautiful spring day in Paris, Christian and Heidsieck were visiting the offices of the Cassiopée record label in a dusty room behind a theatre off the Champs-Élysées. The owner, M. Henri-Jacques Coudert, handed Christian the manuscript. She took it carefully, pulled up a chair to lay it on, and carefully turned each page. First, she saw that the title was indeed written on the cover: Ostersonate (Easter Sonata). Then, she saw that the date was one year earlier than previously thought: 1828. She saw that the manuscript was in Fanny’s handwriting, and showed numerous personal traits of her compositional practice. Finally, she saw that the page numbers that were missing from the manuscript in Berlin were on the lower right-hand corners of the pages. This work was most certainly the long-lost Easter Sonata of Fanny Mendelssohn. The manuscript was now rediscovered, but its new story in the 21st century was just beginning. In 2012, the work received its world premiere by Andrea Lam as a work of Fanny Mendelssohn at Duke University as part of a day-long symposium investigating Fanny's life and work. In 2017, the sonata received its UK Premiere and international broadcast premiere by Sofya Gulyak as part of BBC Radio 3's International Women's Day celebrations. The story was featured in numerous news outlets; listed below are several articles and interviews. Sheila Hayman and Angela Mace Christian with Sean Rafferty after the BBC Radio 3 "In Tune" interview (3.7.17). Eric Heidsieck perfomed the Easter Sonata on tour between 1972 and 1974 under the name Felix Mendelssohn. Recorded in 1972 on the Cassiopée label as the Sonate de Pâques of Felix Mendelssohn. Where can I get a copy of the Easter Sonata? 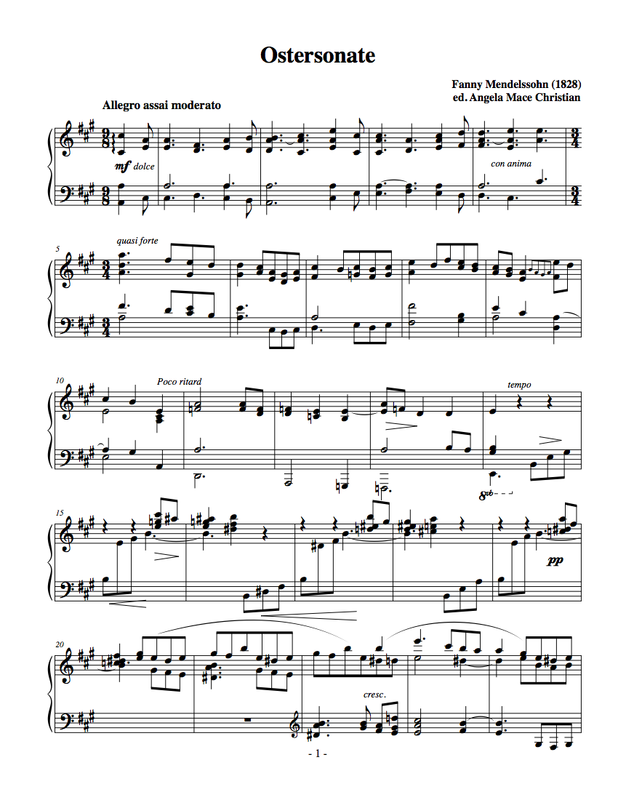 The Performing Edition of the Easter Sonata is available for free download here. This edition makes no claims to be a fully critical edition, as the manuscript is currently, once again, in unknown private ownership after it was auctioned in Fall 2014. This edition is made from a hand-made copy of the work (the copy from which Heidsieck made his recording), and has been improved by correspondence with Heidsieck, and by reference to limited scans of the work provided by the auction house. When the manuscript is made openly available to scholars, the work will finally be able to get its due: a fully critical edition! However, until that is possible, this edition is as close to critical as possible and is highly accurate. Christian transcribed every note from the hand-made copy, set it with music software (Finale), and carefully proofed and edited the final version to be as close to the composer’s intentions as possible. Do I have to pay anything for this edition? No, even though making this edition was a LOT of work, the best outcome for Fanny’s sonata is that it finally gets played, performed, enjoyed and appreciated by pianists and audiences around the world. All I ask in return is that if you have downloaded this work and intend to perform it, please fill out the form below to have your performance listed here on this website. When will you perform this work? Will the performance stream online? If the performance will stream online, how can listeners access the stream?